We made these last year during Emma’s visit and, for shame, I never posted them. We also went to see Mary Poppin’s at the Cadilac Theater….. good times…..good times……. This was the first time in six summers that Emma was unable to make the trek (Shrek was on the agenda) and I sure did miss not seeing her! 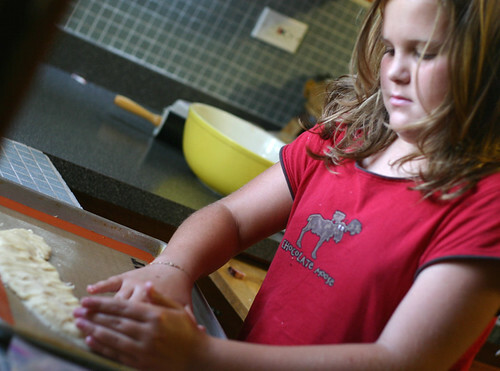 Here's Emma helping out last year making the Fruit Pizza crust. Just click on the photo to go to that recipe. 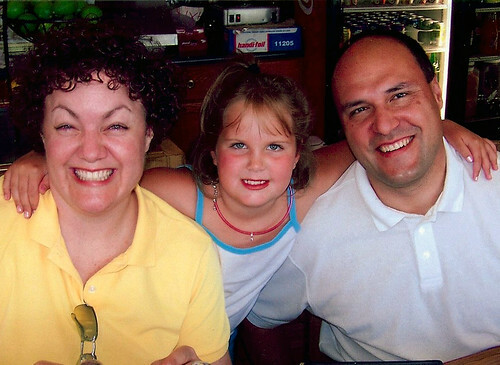 Emma with John & Mary on one of her many trips. Emma started school last week so give me a hand in wishing her a stellar start to the new school year! Taste and add more of any of the ingredients if you want. Use half of this to marinade some chicken tenders in. Use the other half for dipping. You can thread chicken tenders onto skewers or just grill them up without. But if you do use skewers don’t forget to soak them in water so they don’t burn up on the grill. Grill 3-4 minutes on each side. Serve hot or at room temp with the dipping sauce. Satay is such a fun food. Dipping meat, eating it on a stick…I don’t know of anyone of any age that doesn’t love it. Your combination sounds delicious. Great job, Emma! I love satay like this. 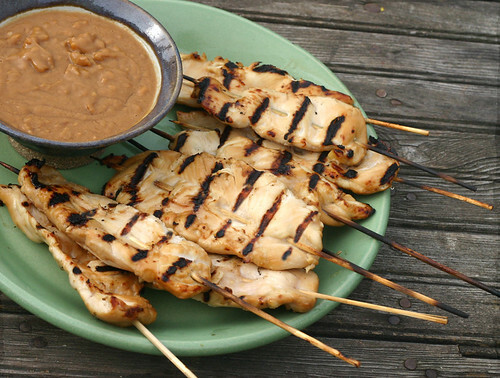 These look so good…I absolutely love the peanut sauce for satay. Emma seems to be quite the budding chef…pretty little girl also. Cute post…what a cute little girl! We were just saying now that she is 12(almost) she can fly on Southwest even on connecting flts…. maybe a trip to Chicago will be on her agenda…. I can’t believe how grown up she is for her age. I always ask how old she is. Last year, before her birthday, I said “How old are you going to be now, 13?”. She replied “13!? I’m going to be 11. Why would I be 13!?”. I’ll never forget it, but I still always think she’s older than she actually is. ………..and YES! she sure is a QTpie! I remember this!!!!! That was really good chicken!!! I always love going to Chicago!!!!!! We love chicken satay and like you, I have experimented with many different peanut sauces and the one we like best is just about identical to yours. Love it!